Relations between Japan and Russia have long been the subject of discussion within international-relations circles. The meetings between Prime Minister Abe and President Putin have been going on for years, yet the situation regarding the peace treaty between the two countries, never signed since the conclusion of the Second World War, is difficult to resolve. While the discussions appear to be about the status of the Kuril islands, they are in reality more profound, covering the role that Japan and Russia play in Asia, especially with regard to the other two regional superpowers, namely China and the United States. Vladimir Putin and Shinzo Abe have met 25 times over five years, an average of five meetings a year, one every two-and-a-half months. Such an active relationship not only demonstrates the closeness between the two leaders but also their difficulty in trying to reach an agreement to solve the longstanding territorial dispute surrounding the Kuril Islands. Understandably, Moscow does not intend in any way to renounce its sovereignty over the islands, especially given the geostrategic significance of the port city of Vladivostok. This important Russian city hosts Russia’s Pacific Fleet; and when one looks at the map, it is easy to understand the importance of the Kuril Islands. If these islands were militarized against the Russian Federation, then they could effectively block the Russian fleet’s access to the Pacific. Moscow faces the same problem with the Black Sea Fleet, where it needs to navigate through the Turkish Straits to reach the Mediterranean; the same is the case with the Baltic Fleet, located in St Petersburg and Kaliningrad, with Russian naval vessels having to navigate between Finland and Estonia, if coming from St Petersburg, and then through the Danish straits, between Sweden and Denmark, to reach the Atlantic Ocean. For military and strategic reasons, unfettered access to the oceans is an absolute necessity for a major power like the Russian Federation; hence the importance of the Northern Fleet’s position in Severomorsk, and of the naval base in Tartus, Syria, which effectively allows Moscow to have access to the Atlantic and the Mediterranean Seas without having to worry about Turkey or the Nordic countries vis-a-vis St Petersburg and Kaliningrad. The question is more complex with regard to Vladivostok, given that Russia has little other option other than to sail through the Kuril Islands to gain access to the Pacific Ocean, making it imperative for Moscow to maintain control over these islands. Leaving aside the historical results of the Second World War, which conferred on the Russian Federation full sovereignty over the islands in question, today this dispute prevents the two countries from further deepening their economic and even political ties. Putin has repeatedly reiterated in Abe’s presence the need for both countries to sign the peace agreement and reach a compromise over the disputed islands. Putin proposed a mutual use of the islands by Japan and Russia in terms of ports and the free trade for goods and even proposed the issuing of a dual passport to the citizens of the islands in order to guarantee maximum freedom of movement. 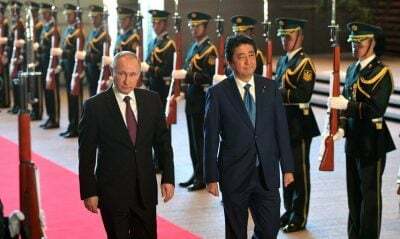 Whenever Abe and Putin meet, the Russians make several overtures that only see their Japanese counterparts respond with such unacceptable proposals as the return of sovereignty over the entire Habomai, Shikotan, Kunashir and Iturup islands (as they are known in Japan). Russian diplomacy has even tried to separate the question of the islands from the post-WWII peace agreement between Tokyo and Moscow in order to accelerate one of the crucial aspects in the relations between the two countries, but to no avail. Japanese Prime Minister Shinzo Abe sparked outrage in Moscow when he spoke of the need to help Russians on the islands “accept and understand that the sovereignty of their homes will change hands.” The Russians furiously summoned the Japanese ambassador to complain that Abe’s statements were an “attempt to artificially raise the temperature” over the issue of a possible peace treaty. In addition to Russia’s national-security considerations surrounding the Pacific Fleet, there is an important aspect of Japan-Russia relations that needs to be mentioned. The trade between the two countries has increased by 18% in 2018 in comparison to the previous year, reaching almost $15 billion. This, in an environment where many agreements are not ratified for lack of a peace agreement, severely limits cooperation in certain strategic sectors. There is also the regional and global aspect of this relationship, which is of considerable importance for several reasons. First of all, the geographical position of the two countries determines their influence in the Asian region, which is going to constitute the center of gravity for geopolitics in the 21st century. The second factor is the privileged relations Tokyo has with Washington and Moscow has with Beijing respectively. To fully understand the multipolar revolution in progress, the quadrilateral scenario involving Japan, Russia, China and the United States seems to be the most suitable. Washington’s move to abandon the Trans-Pacific Partnership and impose sanctions and tariffs on allies and enemies alike has left few weapons available to Japan to offset China’s economic weight, thus forcing Abe to engage in constructive dialogue with Xi Jinping. The recent meetings between the two leaders have laid the foundations for a future economic cooperation that until a few years ago seemed practically unthinkable. The progress being made between the two rival powers of Japan and China has prompted Putin and Russian diplomacy to bring about strong economic cooperation for the future. To this end, the Eastern Economic Forum held in Vladivostok saw the participation of Abe and Xi Jinping, together with Vladimir Putin, aimed at reaffirming how cooperation and economic development is an achievable goal for all parties involved. Abe stated, “We will push bilateral ties to a new stage so as to construct a foundation for peace and prosperity in north-east Asia”, expressing the intentions of the three leaders to advance mutually beneficial cooperation. Washington, as usual, is the elephant in the room, now relegated to a vanishing past where the superpower made the decisions and others obeyed. From Washington’s unipolar perspective, the rapprochement between Russia and China is seen as a nightmare, not to mention Japan’s dialogue with Russia over a peace treaty. Abe seems to have adopted Erdogan’s ambiguous style, ready to balance himself against multiple powers to extract the most advantage for Japan. It is a strategy that often does not pay and may in fact only end up exasperating the other parties. Japan, like the Europeans, should abandon its undue deference to the United States and the accompanying status as a colonial outpost. The pressing need to develop peaceful and fruitful relations with such neighbors as Russia and China should override Washington’s desire to sabotage them. The emerging international multipolar reality is based on dialogue, cooperation, development, mutual respect, and deterrence. The Asian region is the place where important interests of regional and global powers will intersect in the immediate future. The need for China, Russia, India and Japan to put aside their differences and conflicting strategies will become imperative as Washington demonstrates its readiness to exacerbate existing differences for the purposes of preventing regional integration in a multipolar context. The prospect of a peace agreement between Russia and Japan represents the first step in this direction, but it also requires a strong spirit of independence to resist Washington. The trade policies implemented by Trump, and his approach towards international relations, offers Washington’s allies like Tokyo the opportunity to advance an independent foreign policy free of Washington’s diktats. This can already be seen in such commercial partnerships as those involving Huawei and such technology fields as those involving 5G technology.